Every 3.4 years a hurricane passes within 150 nautical miles of Rehoboth Beach. Every Labor Day for the past 20 years, hundreds and thousands of spectators gather at Poodle Beach to watch drag volleyball. What began as a pick-up game twenty years ago between nine gay guys in ladies’ swimsuits and a team of lesbians has evolved into a bona fide Labor Day tradition. Costumes. Political satire. Coordinated routines. A beach full of mostly men in swimsuits ringing the volleyball court, speakers blasting disco music, and a boardwalk full of overflow viewers stretching from Prospect Street to Queen Street and beyond. That’s drag volleyball, baby. I recently sat down on a beach towel courtside to talk with Barbara Anne, one of only two originals still playing. A stalwart of the game, she gave me the history of drag volleyball. The game has been played in heat, wind, in rain, even in a hurricane, every year except in 1990. That year, some of you may remember, was the height of the anti-gay sentiment in Rehoboth. “Keep Rehoboth a Family Town” was the rallying cry of then Mayor Hughes and his band of anti-homo homeowners and the fellas felt it best not to play. Barbara Anne introduces me to a well-built older man who grabs a quick drink and heads back onto the court. It’s Flo the founder of the game. She’s the one who brought out the original swimsuits. Flo still serves and bumps during the summer but no longer plays in drag. She keeps the net, which I learned has been passed down for forty years. 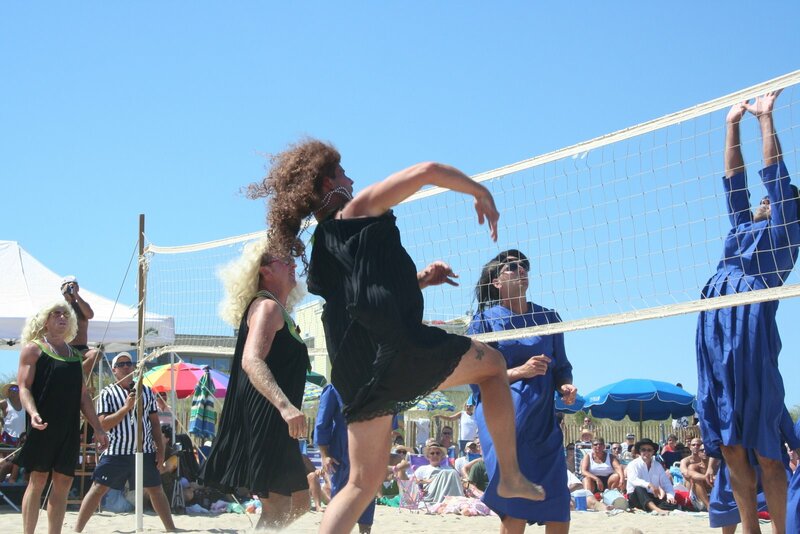 Drag volleyball may have been around for two decades, but gay guys have been playing volleyball on the beach for a lot longer. Way back in the 50’s, I’ve been told the gay guys played on the beach at the end of Olive Street near the Pink Pony, a Boardwalk bar popular with gays and lesbians. The current net has been patched and repaired many times — a sort of symbol of the resiliency of the gay and lesbian community in Rehoboth. Perhaps it ought to be donated to the Rehoboth Historical Society Museum? Along with some wigs, costumes, and photos, of course. Seriously, if the Lingo family bible is in there on a stand, why not the net? Game day starts early, about 8:30 am when the net is raised and chairs, umbrellas, and tents are set up. The players arrive late morning to warm up, and then around noon leave the beach to go slip into their drag. One team prepares on Prospect Street, the other on Queen Street. Then at 1pm the teams make their grand entrances, promenading through the cheering crowds and onto the court. Game on. This year’s match had to be one of the most-watched ever. I’d estimate several thousand spectators watched Joan Crawford and her pack of bonnet-wearing, baby-toting Texas Mormons, including Vice Presidential Candidate Sarah Palin, go down in defeat to the hot girls from the popular television show Deal or No Deal. Afterwards, I asked Hot Girl 06 from the winning team about the routines. Seems neither team knows exactly what the other team’s theme will be and that’s part of the fun. Generally, however, each team choreographs an entry, a cheer, a song, and a finale. Planning for the next year often starts the day after the match. Practices begin about a month before. Not bad for a group of guys, none of which are honest to goodness drag queens. So what’s the link between drag queens and hurricanes? Well, they both tend to catch our attention. They cause mayhem. They’re unpredicatable. They have fabulous names and they show up in Rehoboth in the late summer. Okay, I admit it’s a stretch. Will you believe I just liked the title?